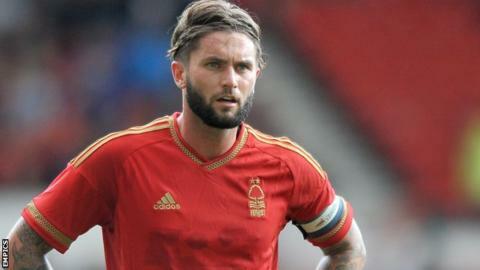 Nottingham Forest want Burnley to include an un-named player in any deal for Henri Lansbury, according to Reds manager Dougie Freedman. Lansbury looked set to move earlier this week before owner Fawaz Al Hasawi denied a £4m deal had been accepted. Freedman said the "ball is back their court" after Lansbury captained the Reds to a 2-1 win over Rotherham. "We've enquired about one of their players to put them into the deal," Freedman told BBC Radio Nottingham. "I want Henri to stay. I've asked for one of theirs in the deal and I'll consider it." Freedman said he would "not disrespect" Burnley by naming the player he wants. "I've had a conversation with my people and they have had a conversation with their people. We will wait and see what happens," he added. "If I decide to let Henri go I have to find replacements, my squad is very thin. There is one player that I think will help us with it. It doesn't necessarily need to be in the same position. "I'm only going to do what is best for the football club, Henri knows that." Freedman praised the midfielder for his efforts in helping Forest fight back against the Millers at the City Ground on Saturday to clinch their first win of the season. "Don't ask me what Henri is feeling because you have just seen his performance," Freedman said. "It was a captain's performance, delightful to watch. "His attitude is great and he is always always going do right by the club because the club has done good by him." Freedman, who took over from Stuart Pearce at Forest in February, said Al Hasawi insists he has the final say on signing and admitted the owner stands to be disappointed on occasions. "It is up to me, when I'm ready, to make the right decision for the football club. I will not let the fans down," Freedman added. "Sometimes I will let the chairman down, but you know what, he is a big enough man to sometimes take that as he has given that responsibility." Freedman also confirmed that the club are still trying to negotiate a move for Lille striker Michael Frey.